How many Everton fans will know that Everton football clubs nickname was originally “The Black Watch” ? Well it goes way back to when the football club was formed, in those days shirt colours were not very well regulated and all sorts of colours were worn. In order to solve this problem Everton decided to dye their football shirts black with a red diagonal stripe to add a bit of colour. The resultant shirt was similar to the Black Watch uniform of the Highland Regiment so their first nickname was born. Everton of course eventually changed to a royal blue football kit and an obvious nickname followed – The Blues, they are still known as this but their most commonly accepted nickname is The Toffees. We've shown below a couple of cigarette cards that depict the football clubs accepted "Toffees" nickname in caricature form. "The Toffees. This name is derived from the Everton toffee which was originally made by Mrs Noblett from a shop in the district of Everton. She was adopted as the mascot in the early days and is to-day regarded as a symbol of the Everton team"
Despite the above there are still several explanations exist why the Toffees nickname came to be, firstly it could be because there was a house called Ye Anciente Everton Toffee Housenear the Queen's Head hotel in which the club originally held meetings. In fact the shop above was actually referenced on the cigarette card below which was issued by Ogdens. "This famous club started in 1878 as St Domingo, the name being changed to Everton the following year. as the principal landmark of Everton village was "Ye Ancient Toffee House", it was not long before the sobriquet The Toffees was attached to the club. Adversity has not often came their way, but in 1929-30 they suffered relegation for the first and only time. By winning the 2nd Division in 1930-31, the First Division in 1931-32 and the FA Cup in 1932-33, they created a remarkable record. the first League Championship has been won four times in all and the FA Cup twice." 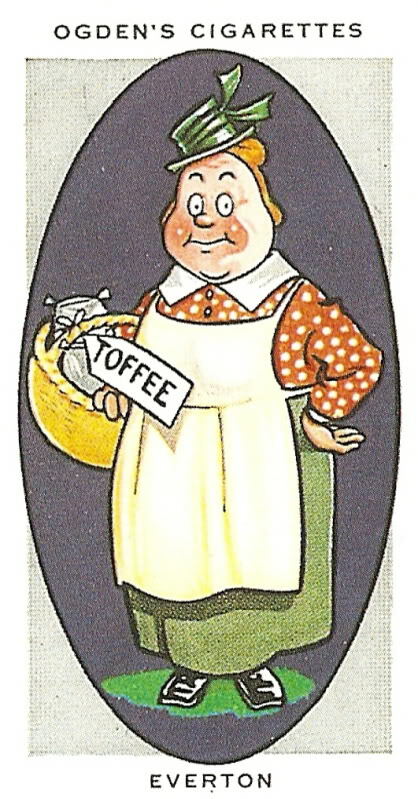 Another theory is that “Toffee” was also a slang reference for an Irishman, a large population of whom lived in the city at the turn of the century, supposedly these “Toffees” tended to favour Everton as their football team. 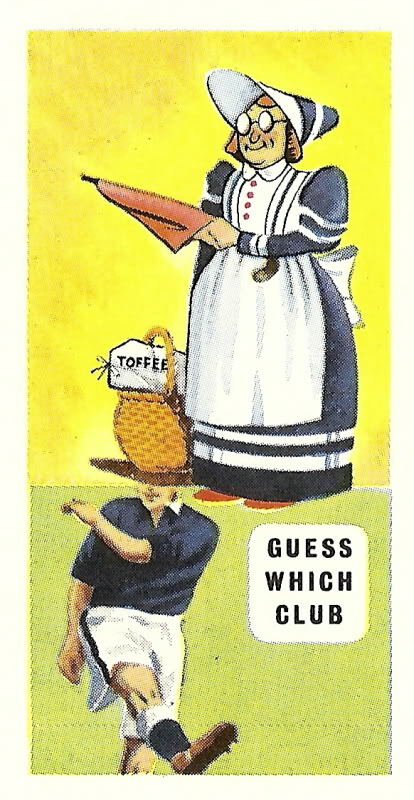 However, and added credence to by the cigarette cards is that the Toffees nickname came about because an lady called Old Ma Bushell used to sell large amounts of toffees on match days near Evertons old grounds, (Stanley Park, Priory Rd and Anfield!) however when they then moved to Goodison a toffee seller closer to the ground (Mother Nobletts) began getting all the business. This resulted in Ma Bushell gaining permission from the club to sell her Toffees inside the ground, hence the Toffees nickname and hence the tradition that still exists of a young girl dressed up in old fashioned clothes giving away Toffees on match days. 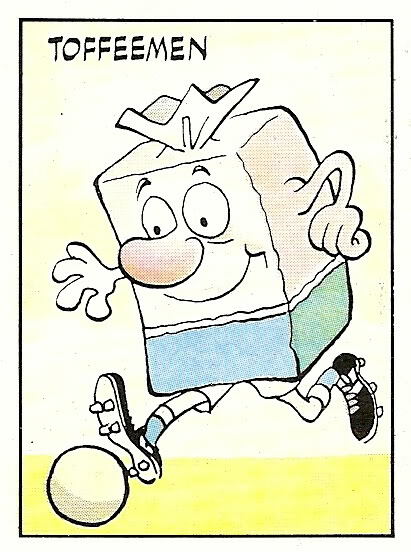 The cartoon above is Paninis take on the Everton football nickname, this character was part of the Panini 86 sticker series. This sticker can be purchased on our Footybits site where it has been mounted in a clear fridge magnet.